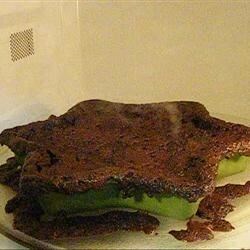 "A WONDERFUL chocolate recipe, made in the microwave. When hot, add a scoop of ice cream! HEAVENLY!" In 9x13 inch microwave-safe cake dish, melt the margarine and 1/4 cup cocoa together. Stir in the eggs. Mix in the 2 cups sugar, flour, nuts and vanilla. Bake in microwave oven on high, for 11 minutes, rotating dish after 5 minutes. Remove from microwave and sprinkle marshmallows on top. To make the frosting: In microwave-safe bowl, combine confectioners' sugar, cocoa, and milk. Cook in microwave for 2 minutes, stir and pour over cake.